Bronchitis affects the bronchial tubes in the lungs and is considered a lower respiratory infection. Acute bronchitis is very uncomfortable – the chest gets clogged with mucus, breathing is more difficult and coughing can become constant, lasting up to two weeks after other symptoms fade away. 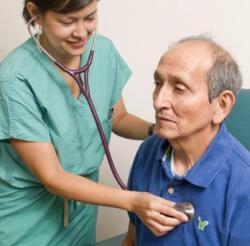 But chronic bronchitis is a serious lung disease that can get worse as time goes on. Cigarette smoking is the number one factor in developing chronic bronchitis. Recurring bacterial or viral infections can also be a factor as well as exposure to chemical toxins or other particulates. Excess phlegm on a daily basis. Chronic bronchitis will continue to worsen, but too many people minimize the potential complications until it has become a serious problem. Since smokers often suffer from chronic bronchitis, it’s dismissed as “smoker’s cough.” Some people suffer from both chronic bronchitis and emphysema. This is called chronic obstructive pulmonary disease or COPD and this combination is the third leading cause of death in the US. Come to your local neighborhood FastMed clinic to discuss your condition with a medical professional. There may be a number of tests to be done and X-rays may be required. We take digital films at each location and have an on-site lab to reduce the time and cost of an outside vendor. After a consultation and evaluation we can decide the proper course of action, including prescription and over the counter medications to relieve your discomfort. FastMed Urgent Care medical staff will be happy to discuss your treatment options. If you are a smoker, please consider a smoking cessation program to help you quit or ask us about prescription medication that help smoker stop.